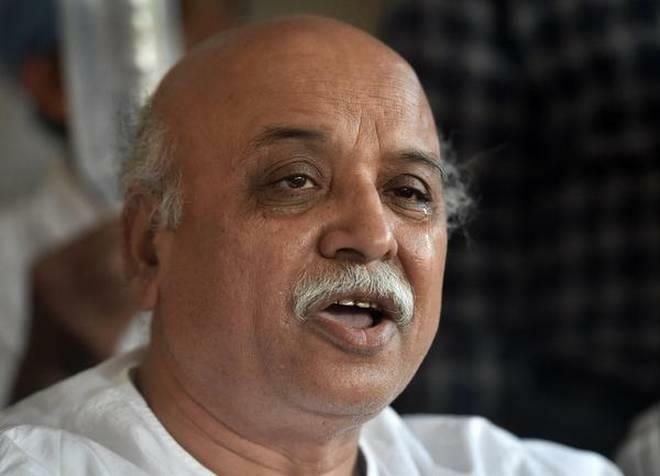 AHMEDABAD: A day after quitting the Vishwa Hindu Parishad in wake of his nominee losing an organisational poll, firebrand leader Pravin Togadia today launched a vicious attack against the Modi government at the Centre. Togadia, who has decided to undertake an indefinite fast from Tuesday, said his "disenchantment" with Prime Minister Narendra Modi began right after the 2002 post-Godhra riots. "I am not in the VHP anymore.... I will continue to work for the welfare of Hindus. From Tuesday, I will go on an indefinite fast in Ahmedabad for fulfilling the longstanding demands of the Hindus," he had said yesterday after former Himachal Pradesh governor V S Kokje defeated his nominee Raghav Reddy in an election in Gurgaon for the post of VHP International president. "I got disenchanted with this government in the last four years. The disenchantment, in fact, had started slowly after the 2002 events in Gujarat," he said, speaking to reporters later. Claiming that scores of Hindus were killed in police firing during the post-Godhra riots, he said he could not understand how it could happen when "Narendrabhai" (Narendra Modi) was the chief minister. "Cases were registered against thousands of Hindus and they were put in jail," he alleged. "In 2014 elections, the VHP offered full support to Narendrabhai. But he called gau-rakshaks `gundas' (goons). Eleven cow-protectors in Jharkhand were given life imprisonment (by a court) after his statement. This hadn't happened even under the Congress government," Togadia said. "This government has taken back cases against Pakistan-supporters and stone-pelters in Kashmir. I was shocked as this government has helped Pakistan-supporters," he went on to say. Togadia said his indefinite hunger strike would be aimed at the welfare of Hindus and to seek construction of Ram Janmbhoomi Temple at Ayodhya, nation-wide ban on cow slaughter, enforcement of the common civil code and relocation of displaced Kashmiri Hindus, he said. All these years he and his associates have been fighting for these causes but to no avail, Togadia said, alleging that "for the last six months, enormous pressure was put on me instead to stop making all these demands." State VHP leaders, however, refrained form expressing their stand on Togadia's proposed fast. Asked if the VHP's state unit would support Togadia's fast, Gujarat VHP chief Ranchod Bharwad evaded reply, saying he was in hospital and could not make any statement. Togadia had made a sensational staement last month, claiming that a Rajasthan police team had come here to abduct him and he feared he could be eliminated in a staged encounter. During the tussle within state BJP between Modi and former chief minister Keshubhai Patel, Togadia, who belongs to the Patel community, was believed to have backed Keshubhai. Before the 2017 Gujarat assembly elections, Togadia had criticised the BJP-led government at the Centre. He also had a meeting with Patel quota agitation leader Hardik Patel, who had campaigned against the BJP.